OBD1 is an old standard implemented in all cars in the world back in 1980's. Hence it's very limiting in quality and quantity of data it can report. For example newer OBD2 can report up to 15,000 possible data parameters (called PID's). While OBD1 can give you up to 300 data parameters. Those 300 parameters can still be useful to mechanics for things like O2 sensors and carbon emission tests. Because OBD1 is very old, this also makes 90% of OBD1 vehicles nowadays impossible to scan — because you can only obtain the scanner from OEM manufacturer. Nevertheless, TOAD® software supports more OBD1 vehicles then any other scanner in the world. Best way to find if your OBD1 vehicle is included on this page — is to perform a search in your browser for your vehicle model. Use different combinations. Eg: Holden, Commodore, VT, V6, etc. Note 2: TOAD works on petrol, gas and diesel vehicles. (Hybrids and Electric cars are not supported). Note 3: What cable/connector to get if your vehicle is found on this page? Firstly, ELM327 will *not* work with OBD1 vehicles. Because ELM327 is only for newer OBD2 vehicles. 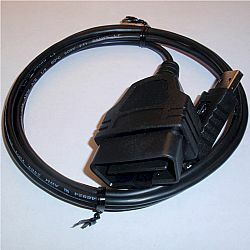 Secondly, if your vehicle is found on this page — then get ALDL cable which you can buy separately from USA or Australia. Get either 12-pin, or 16-pin. Whichever suits your cars OBD plug. 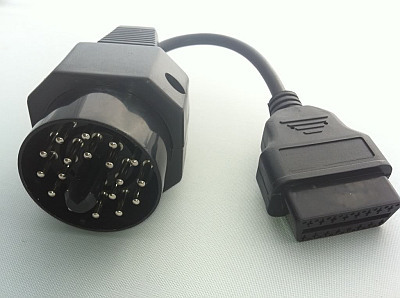 Step 1: Get 16-pin (not 12-pin) ALDL cable which you can buy separately from USA or Australia. 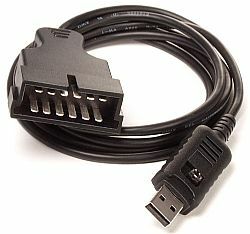 Step 3: All you're doing is this: (a) Plug ALDL cable into laptop (b) Plug extension cable into ALDL cable and car. Download definition files (.xdf and .ads) for your car by right-clicking and selecting "Save as...". Most GM OBDI datastream definitions can be found here. Additional Holden definitions can be found here. NOTE: This XDF is for "full" binaries. Only 256k 0189 EEC-V files should be used. A lot of these parameters are still untested, Ive tried the more common ones ie WOT fuel & Spark, idle rpm etc. However if you choose to play with these, be aware of that you do so at your own risk. The 6DFC & 6DGC both work on the 6DFC xdf file, and 90% of the parameters work for the 6DFD & 6DGD, however I will get a revised xdf for the FD&GD bins asap. 2001 M3 ECU version MSS50.1. Works with ECU types 4.14, 4.19, 3.18 when used with Galletto 1260 flash tool. 32KB files. This adx will NOT work with connected K and L Lines, only with seperated lines. 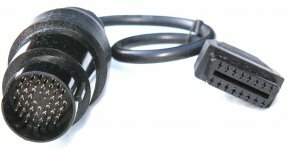 When used with an OBD KKL adaptor the first Byte must be truncated. MW2 uses "Idle Flag" and "High Bat Voltage"
MWAF1 uses "Clear Flood Flag"
MW2 uses "Cool Flag" and "High Bat Voltage"
MWAF1 uses "Not Closed Loop"
MW2 uses "Idle Flag" and "1st Time Idle Flag"
1227808 All VN & VP Holden Commodore models made before Jan 1, 2006 are supported. Cable required can be purchased here (USA). Or here (Australia). MW2 uses "1st time Idle Flag" and "ESC 43B Ready for PE"
MWAF1 uses "Old High Gear Flag" and "4-3 Downshift for TCC unlock"
MCU2IO uses "AIR Divert" and "AIR Switch"
MW2 uses "High Bat Voltage" and "ESC 43B Ready for PE"
MCU2IO uses "Fan #1", "Fan #2" and "Heated Windshield"
MW2 uses "1st time Idle Flag" and "OL Idle Flag"
MWAF1 uses "CL Idle" and "AF Cold Park"
MCU2IO uses "Idle Kicker Switch" and "Idle Kicker Light"